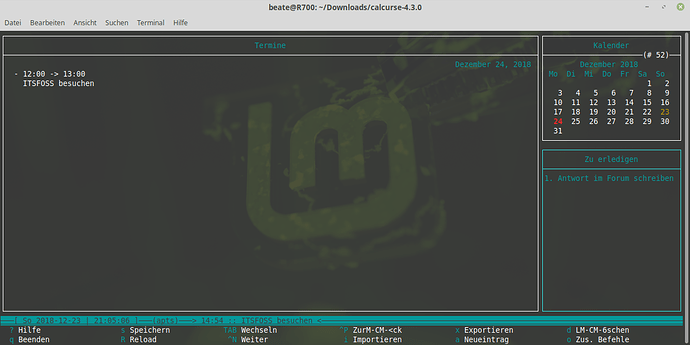 I wanted to compile the nice tool “calcurse”, just to try on my Linux Mint 19. First problem I faced was an outdated C library, so I installed libc6-dev which went fine. The Website suggested to have ncurses installed, so I got it and compiled it, because the version in the repos is older (5.x). drwxr-xr-x 6 root root 4096 Dez 22 22:47 .
drwxr-xr-x 3 root root 4096 Dez 22 22:46 ..
configure: error: Either ncurses or ncursesw library is required to build calcurse! Now I’m stuck at this stage. Maybe there’s only one small tweak to do, that I don’t see yet and someone could give me a hint. That’s the right track. I don’t know the configure options well, but I think there should be an option to specifically choose the ncurses you want, which means you should be able to choose the folder where ncurses is installed. I don’t know if the --includedir option is enough for that or if there is another or better one specifically to choose specific ncurses. Maybe you also just need to add /opt/ncurses/bin to your PATH or you add this folder to --includedir option. Try out something like that, that’s what I would suggest. Okay, now I actually read the error. Try to include /opt/ncurses/lib or something like that. Because that’s where the libraries go. I just tried some hint I found over at askubuntu. I just wanted to say thanks. I have been looking for a program like this for my Parrot Security distro and this fit the bill perfectly. Also, it was available through Parrots repos. Have a good one! In Germany there’s a proverb saying “Zwei Fliegen mit einer Klappe schlagen”.